Clove is among our favorite spices, even more widely known and more generally used than ginger. They are the immature fruit and flower-buds of a beautiful, aromatic, evergreen tree of the tropics. This tree reaches a height of from thirty to forty feet. The branches are nearly horizontal, quite smooth, of a yellowish-gray coloration, decreasing gradually in length from base to the apex of the tree, thus forming a pyramid. The leaves are opposite, entire, smooth, and of a beautiful green color. The flowers are borne upon short stalks, usually three in number, which extend from the apex of short branches. The calyx is about half an inch long, changing from whitish to greenish, and finally to crimson. The entire calyx is rich in oil glands. The petals are four in number, pink in color, and drop off very readily. The stamens are very numerous. All parts of the plant are aromatic, the immature flowers most of all. 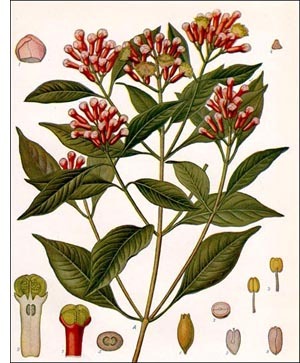 The clove-tree was native in the Moluccas, or Clove Islands, and the southern Philippines. Now cloves are extensively cultivated in Sumatra, the Moluccas, West Indies, Penang, Mauritius, Bourbon, Amboyne, Guiana, Brazil, and Zanzibar -in fact, throughout the tropical world. Zanzibar is said to supply most of the cloves of the market. The cultivation of cloves in Zanzibar is conducted somewhat as follows: The seeds of the plant are soaked in water for two or three days, or until germination begins, whereupon they are planted in shaded beds about six inches apart, usually two seeds together, to insure against failure. The young germinating plants are shaded by frameworks of sticks covered with grass or leaves. This mat is sprinkled with water every morning and evening. The young plants are kept in these covered beds for nine months, after which they are ready for transplanting. Transplanting must be done carefully, so as not to injure the roots. The plant is dug up by a special hoe-like tool, lifted up in the hand with as much soil as possible, placed upon crossed strips of banana fibers, which are taken up by the ends and wrapped and tied about the plant. The plant is now carried to its new locality, placed in a hole in the soil, the earth filled in about it, and finally the banana strips are cut and drawn out. The transplanted clove plants are now carefully tended and watered for about one year, but they are not shaded, as during the first year of their existence. Usually many of the transplanted plants die, which makes replanting necessary. This great mortality, it is believed by some, might be reduced very materially by shading the recently transplanted clove-trees for a time. The clove-tree may attain an age of from sixty to seventy years, and some have been noted which were ninety years old and over. The average life of the plantation clove-trees is, however, perhaps not more than twenty years. The trees begin to yield in about five years after planting. The picking of the immature flowers with the red calyx is begun in August and lasts for about four months. From two to four crops are harvested each year.